Simple ideas live long lives. Vida is a classic, destined for eternity. Vida shows off our beautiful, rich paper perfectly, with its clean, simple text, and lots of white space. The supporting font itself is pure elegance; a bold version of the all-caps copperplate family. The best way to describe this style is: clean, clear, simple and elegant. 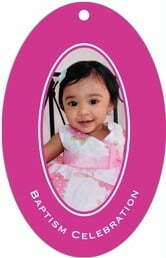 Customize your Vida baptism gift tags to commemorate your baptism ceremony today! Vida baptism tags are printed on one side and are blank white on the back. You have the option to add text on the back—just ask! Baptism tags are printed on extra-thick cover weight white paper and come in a variety of shapes and sizes (including square, circle, heart, a scallop-edged circle, ovals, and other shapes). Baptism tags come pre-punched with a small round hole to thread your choice of tying material. They are punched out individually and packaged as a set in small bags. 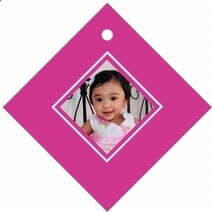 Select a shape and color to start personalizing your Vida baptism tags today!